Good Spanish restaurants aren’t a dime a dozen in the part of the Hudson Valley where I live. The only one in the area–El Castillo Español–closed not long ago, so I was happy to hear that Rei Peraza, whose cooking I enjoyed at El Hotel Rhinecliff a few years ago, had opened a tapas place with his own distinctive stamp in Tivoli, an offshoot of Red Hook in northwest Dutchess County. No tortilla española or shrimp al ajillo here; it’s all about imaginative nose-to-tail stuff. 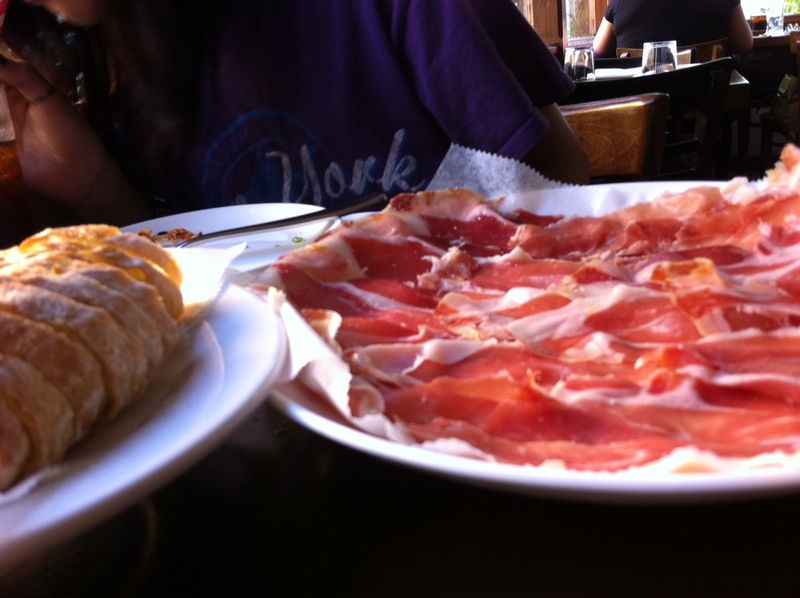 But you can’t skip the jamón, Spain’s funky hearty sweet version of prosciutto, and we didn’t either. My kid’s a pescatarian, but quality cured pig leg is where she draws the occasional line. The other day, with slightly more time and cash in my pocket than I’m used to, I swung by Panzur with my 11-year-old daughter for a tapa or two. I worked in the kitchen of that space for one long week about 12 years ago in one of its many previous incarnations, but it looks markedly different. Two eating areas with a central bar opened things up and made for an interesting division of the space, and bold art on the walls offers a modern lift. You can’t have just one tapa and there were many temptations on the menu, rarities like rabbit rillettes and potted pig head, seasonal items like ramps and fiddleheads. Everything sounded delectable; I would love to go with a big group and try lots of things. 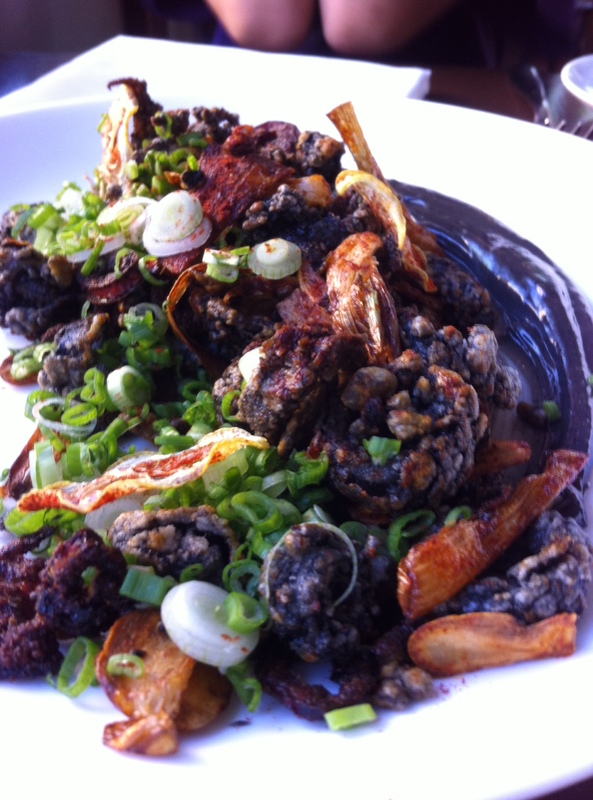 I was craving cephalopods and unfortunately the octopus brick I’d seen on the online menu was out of date, so we had black fried squid, a tasty and visually arresting dish. Dark super crispy morsels (I love that they’re called squid, not “calamari’) were showered with alliums and dusted with smoky pimentón powder. On the side was a large long schmear of luscious deep dark squid ink allioli. I would bathe in that stuff. Fortunately the waiter snatched the plate away before I dipped my bread into every last speck. I had a glass of sparkly cava, a crisp Catalonian Mont Marcal Brut Reserve Penedès 2010, and my daughter some black currant tea tivoli 2013, which came with lots of lemon and agave syrup, a nice touch. For the two drinks and tapas it set us back about $55 including tip. When my ship comes in I want to go back and make my way through the menu.